Across the United States, more than 2,600 people have been condemned to prison for the rest of their lives, with no hope of ever being released, for crimes committed as youth. Nearly 300 of these individuals, including Michelle’s brother, are in prisons across California. In the three weeks that I spent in Sacramento leading up to the vote on SB 9, I had the privilege of working alongside fierce advocates like Michelle. I was inspired by their dedication and unified message throughout the campaign, even during times of uncertainty. This unity was especially apparent during the final stretch before the vote as faith leaders held a day of prayer and action, youth from Los Angeles took an overnight bus to Sacramento to speak with their elected officials, and people from around the state and nation literally jammed legislators’ phone lines with calls of support. The hard work put forth by so many, and a reminder of the work that lies ahead, was on display during the debate and subsequent vote on SB 9. From the Assembly gallery, I listened as legislators discussed disproportionate minority contact, the consequences of overly punitive policies that sweep thousands of children each year into the criminal justice system, and inadequate representation – topics that are often neglected in the development of sound criminal justice public policy. SB 9 received 40 votes that day, one short of the required majority. 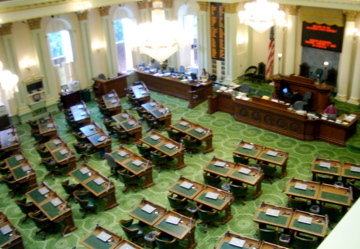 Although the bill did not advance, the commitment to SB 9 and fair sentencing of youth continues in California, and will carry through to the next vote, which will likely occur early next year. The vote underscored the difficulty associated with criminal justice reform, but more importantly, strengthened the coalition’s commitment to this fight. Like California, states across the country remain steadfast in their commitment to ending juvenile life without parole. Sentencing youth to life without parole runs contrary to our vales as a nation--we are the only country in the world that gives this extreme sentence to youth. Instead of this harsh sentence, teenagers who commit serious crimes should be held accountable in an age appropriate way. We must end the practice of sentencing youth to prison for the rest of their lives without hope of release, because people should never be declared worthless and stripped of the opportunity for rehabilitation due to crimes committed in their youth. Daniel Gutman is the State Strategist, Campaign for the Fair Sentencing of Youth. The Campaign for the Fair Sentencing of Youth is a national coalition and clearinghouse that coordinates, develops and supports efforts to implement just alternatives to the extreme sentencing of America’s youth with a focus on abolishing life without parole sentences for all youth. Visit our site to learn more about the Campaign and become an official supporter.